A newly-retired acquaintance said he'd like to come for a game and he'd never played either of the Two Fat Lardies WW2 rules. So after a bit of email discussion a date was set and I devised a scenario. Bert's company was to envelope Grochstadt from the right while he attacked from the front. They had tanks and flame throwing Wasp carriers, but he still didn't like it. The 4th Battalion, Blandingshire Fusiliers had lost a lot of men in Normandy and Holland. The companies were barely platoons. Where was the bloody artillery? His platoon on the far left started to go to ground in the middle of the field. "C'mon! Keep going!" He waved them forward. It was a pretty bloody game. 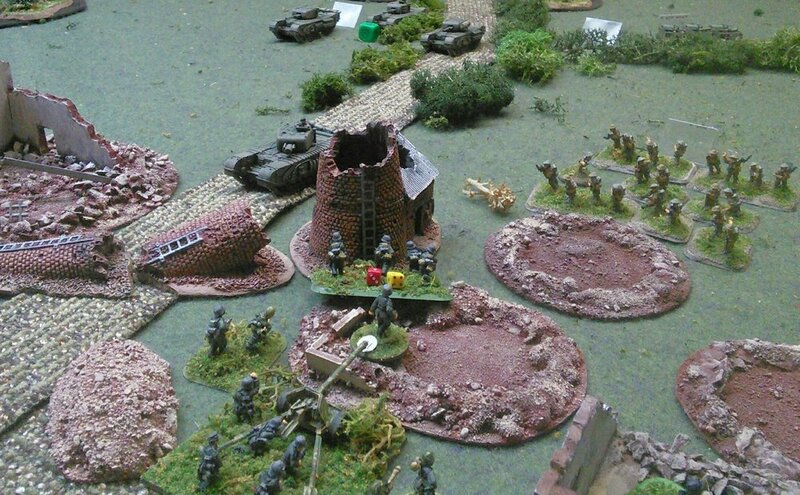 2 Platoon rushing into the German MGs without support or suppressive fires was devastating. The AVRE would've been great for blasting the Germans out of their defences but a stalking Panzerschrek team got it's card first. The Wasps once they finally showed up were pretty devastating, which was good for the Blandingshires, as the attack was running out of steam.